We have a street address! No standard USPS mail delivery, but we saw a UPS truck pass on our road this morning! 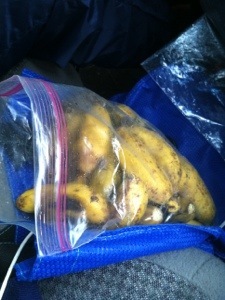 Below are two pictures of our breakfast– we picked up our rack of apple bananas, and many fell off. 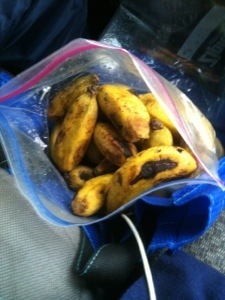 These bananas are very sweet and the perfect size- one bite for each of us per banana. 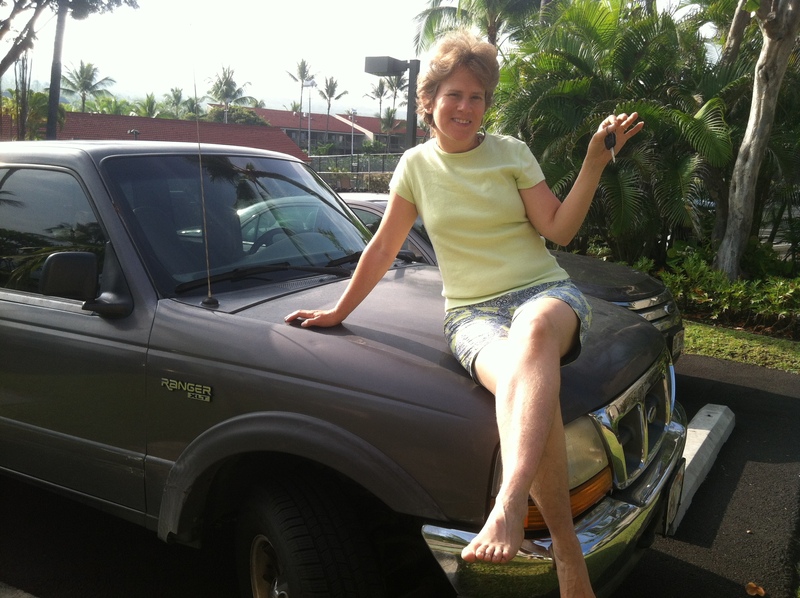 We are at the auto repair place in Pahoa now (8:44am). Our errands before here included the Kurtistown Post Office, the Keaa’u Transfer Center (trash & recycling), and the Pahoa DMV. I decided to keep a running list of food we have on hand at the moment. I may post this again as it changes. 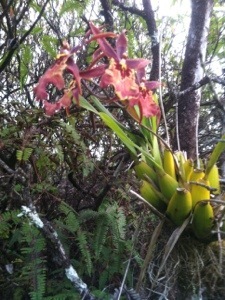 You may see fruits listed that you have never seen or tried–that is because Rachel wanted to try rare Hawaiian fruits. 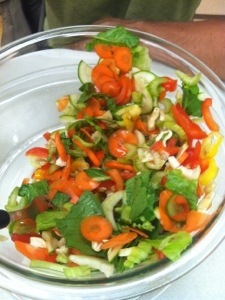 Below is a picture of our salad 1/2 eaten. It was heaped up over the rim! We will finish it easily! 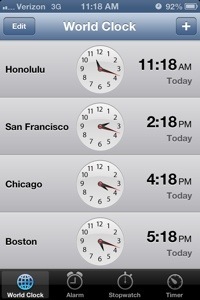 We did errands in Hilo today from around 8 am-6 pm. First stop, community center proved fruitless (closed). 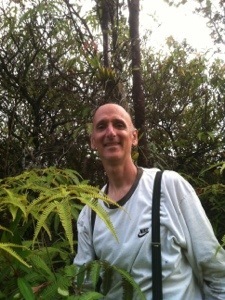 On our way into Hilo, we picked up a hitchhiker who was SO grateful. He was on his way to CU Hawaii, but he didn’t know where it was, so it was good we helped him get there. We drove into Hilo for the cheapest gas. Around the corner is Garden Exchange where we got pallets last week. They welcomed us to come back often, so we did. Another 10 pallets loaded! We’ll use them for building a composting toilet, floors for our tents, and maybe even walls for a screened structure. We visited offices for Parks and Recreation and Forestry and Wildlife (obtained two permits for getting Tree Ferns). We didn’t get library cards because it is closed on Sundays and Mondays. We didn’t do laundry because we forgot soap but decided to leave our soap in the car from now on. 🙂 Not doing laundry enabled us to sit in on the Hawaiian Acres Community Association Board Meeting at 6:30 pm (hence access to WIFI and the post). Having a Hawaiian Acres Farmers Market is being discussed right now– oddly enough, a controversial issue! Sounds like the easy life, but in the past 3 weeks, we have accomplished a lot! *Cleared almost the entire length and width of our driveway! *Purchased a new-to-us 1999 4×4 Ford Ranger extended cab truck! *Made an appointment for our driveway to be leveled this Friday, June 14! *Secured a 300 gallon tub for cheap (it had cracks, but right now works great as a place to shower in). Much love to all and more pictures to come! Since we now have a truck, we are even more desirous of a driveway. Yesterday, we got two quotes for excavating the driveway from the road up to where “Max” (aka Big Max, our bedroom, a 7’x7′ lawn and garden shed made by Rubbermaid, sold at Home Depot heretofore referred to as Max) is. Max is in a high spot that drains well that is about 30′ x 40′. 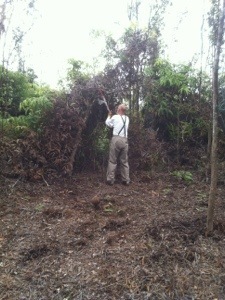 We are widening the clearing today and working to clear a path where the driveway will be. Stay tuned for more updates!! We love all of you!! 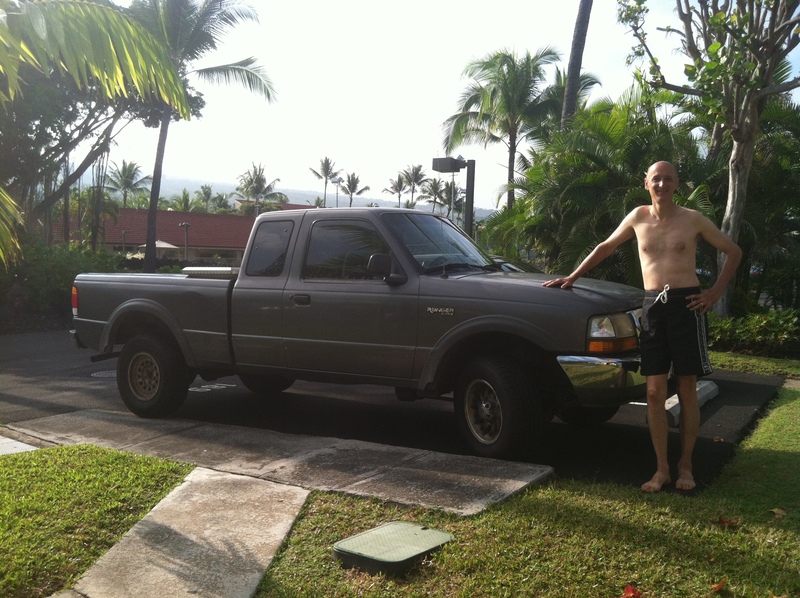 We have named our truck Pahoehoe, meaning the smooth kind of lava. 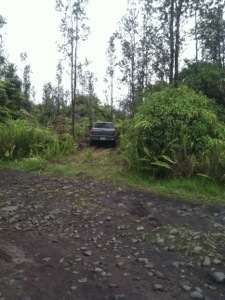 Our property is on this kind of lava and our truck is the same color as Pahoehoe. (pronounced pa-hoi-hoi). Here is our new truck! We are still on the Kona side this morning. 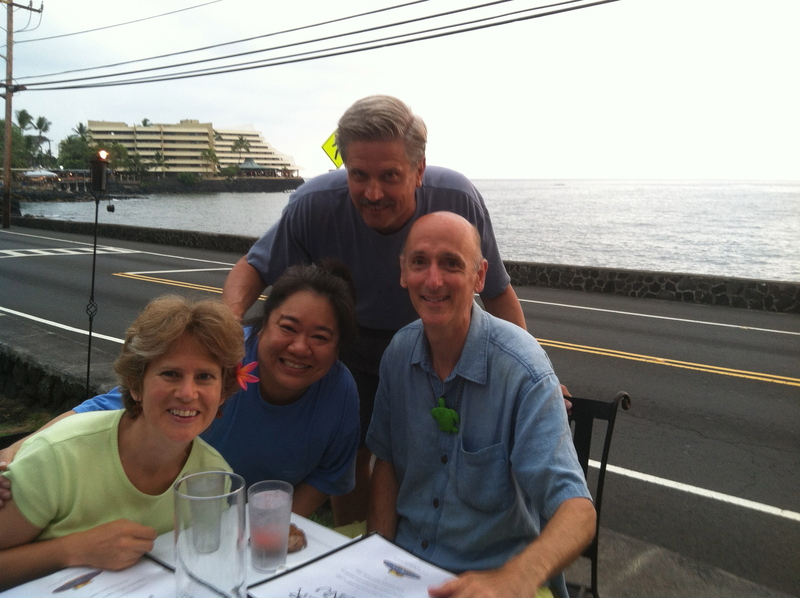 Last night (Friday, May 31), we had dinner with Ed and Marini Ballard at Island Lava Java with live music and an ocean view. Here are the four of us! After ordering, it started to rain, so we moved inside under cover. Today, we are going to go to the Farmer’s Market in Keauhou (near Kona) and snorkeling afterwards.